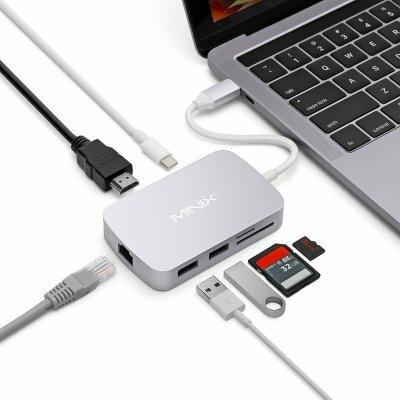 Successfully Added MINIX USB-C Hub - 7 Ports, Gigabit Ethernet Port, 2x USB 3.0, Micro SD, SD Card Slot, USB-C, HDMI, 4K Media Support to your Shopping Cart. This ultra-sleek and lightweight USB-C adaptor from MINIX lets you use your new type-C laptop with all your exciting PC accessories. Coming with 7 ports, this USB-C hub brings along great efficiency and connectivity. From now on, you’ll never have to struggle again to connect your new device to any of your older generation electronic gadgets. Simply plug it into your laptop, and you’ll be all set to hook up your laptop to any gizmo of your liking. The USB-C hub itself looks stylish and is extremely thin - making it easy to carry around anywhere you go. The MINIX USB-C Hub comes with a 12 months warranty, brought to you by the leader in electronic devices as well as wholesale PC accessories..